Hip Dysplasia is a condition often picked up in newborns when the ‘ball and socket’ joint of the hip don’t fit together correctly potentially resulting in increased risk of joint dislocation. The hip joint is made up of 2 bones; the femur (thigh bone) and the acetabulum (part of the pelvic bone). These bones make up a ‘ball and socket’ joint which is supported by ligaments to create a strong and stable joint. IN hip dysplasia the ‘socket’ is shallower than normal, and slack ligaments may also allow the ‘ball’ to slip out of the joint. A low clunk or click sound when you move their legs around, not a snapping sound can be normal. Weight-bearing to one side when sitting, or starting to walk. Avoid – Tight swaddling around the legs. Legs should be free to move. Avoid – Baby seats, car seats, carriers, and slings that bring legs together at the knees. The legs should not hang or be stretched straight out and together. 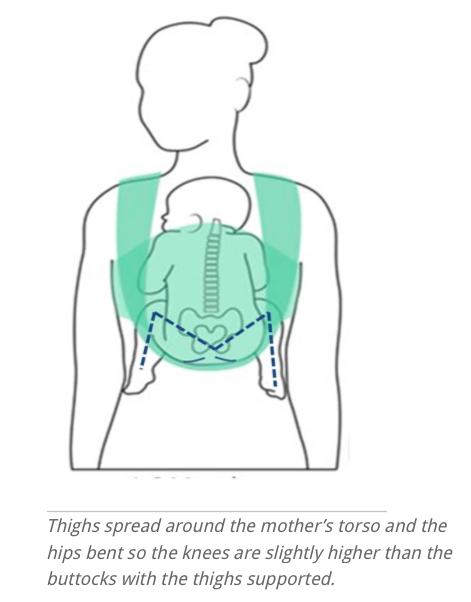 Encourage correct position of the hips when using a baby carrier by using one with a wide base of support under the baby’s bottom and upper thigh. It is important for the upper thigh to be supported with the knee slightly higher than the hip thus preventing the weight of the leg hanging from the hip joint. Supporting the child’s body through the changes made by any medical intervention. May help reduce any musculoskeletal or mechanical strains in the opposite hip, lower back and sacrum area.